A 1980s office building has been fully refurbished and now benefits from a 25% increase in floor area. The space has been rationalised and two new storeys have been added, all with an efficient structural design dramatically reducing the carbon footprint. 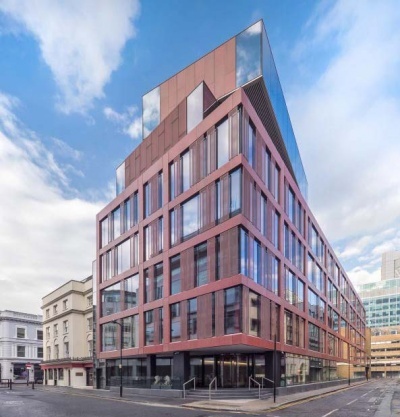 The works involved extending the height of the building from five to seven storeys, building a four-storey addition to one elevation and remodelling the circulation cores to provide more office space and an additional lift. The exposed steel frame in this modern ‘raw’ building is painted bright red to emphasize and celebrate the structure. The team cleverly added 25% floor area to this 1980s office without needing to strengthen the existing steel structure. The original steelwork, previously encased in concrete, was exposed to make it a statement of the building. This two-storey extension is a fine example of how testing and good engineering can give a steel building new life.